Since 1975, Oregon state law mandates that at least 1% of construction funds for new or remodeled buildings with a budget over $100,000 be used for the acquisition of public art. 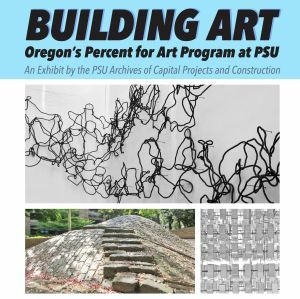 Building Art shows how construction has generated public art at Portland State through examples of Percent for Art exhibitions on campus, with behind-the-scenes looks at the selection, design, and installation processes. Discover public art at Portland State, how it was created, chosen, and placed, and how new artists can get involved with the Percent for Art program. Building Art is created by the Portland State University Archives of Capital Projects and Construction. The exhibit can be viewed during Summer 2014 in the PSU Library first floor elevator lobby.